Knitting Park: Son of A.R.A.N. Fini! I finished up Matt's SOA on Friday, but I wasn't happy with the bottom ribbing (a little too loose), so I went down a couple of needle sizes and reknit it. I'm very very happy with this project. So is Matt. I will say we both were surprised at how warm of a sweater it is. I was hoping the acrylic in the Cotton Ease would "lighten" it up, but quite frankly, it has the weight and feel of a cotton sweater. The acrylic made it easier to knit for sure, but the seven skeins of yarn in this sweater make it heavy and warm. So while it might not be the three season sweater we were expecting, we're both happy with the results. Pattern: Son of A.R.A.N. by Janet Szabo. 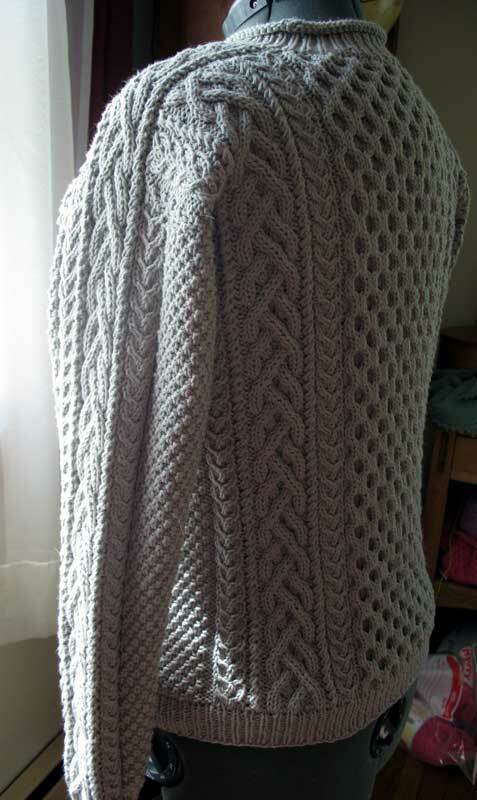 This pattern was done as a knitalong on the aran knitlist years ago. Yarn: Lion Brand Cotton Ease in Stone. Changes to the pattern: well, since I used the Cotton Ease, I had to basically do all the math. I got 20 sts to 4" in moss stitch, and the pattern was written using 22 sts. to 4". I also ended up removing some purl stitches between the cables to get the stitches to fit. I also had to change the layout on the cables for the sleeve. I used a twisted stitch on the sides of the main cable for the saddle, then I added the Little Twist Cable to the sleeve section (viewable in the second photo). 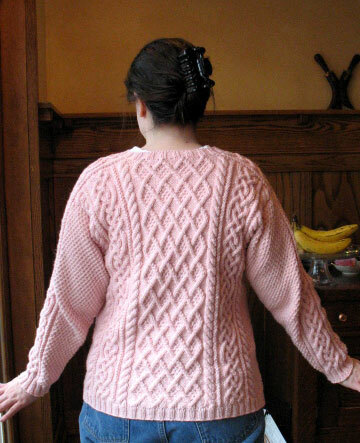 Problems with the pattern: well, since I only used the pattern for the cables and their layout, any problem with the math was self inflicted (note to self: 11" long sleeves means that you didn't do the math right somewhere). Overall impressions: this project ROCKED!!! 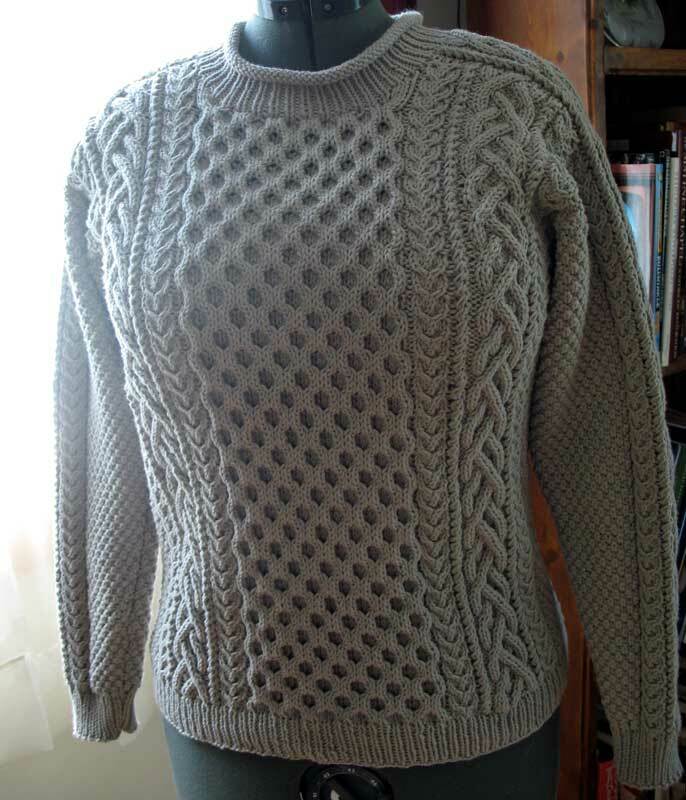 I love the Cotton Ease, the pattern is simply beautiful (Janet has such a delightful touch with cables), and it fits Matt beautifully. He loves the easy care (machine wash and dry) so he's not worried about wearing it. So four thumbs up! (two from me and two from Matt). So now I'm back to working on my Fall Back Cardigan (the wool version of the Spring Forward). I ripped back the sleeve and did it right and I'm much happier. The class only has one more session, but I'm thinking only one class on the sleeves might not have been enough (we covered the picking up the stitches and I tried to explian how to figure out the sleeve decreases, but since I'm math challenged, I'm not sure how clear I was). So we might need to add an other session. 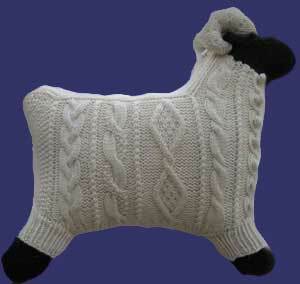 Isn't it funny how we as knitters find the "right" designer? I've knit more Janet Szabo designs than any other designer. By far. I like how she designs, I like her construction technique and I loooove how approachable she is (I've been joking for years that I'm one project away from a restraining order). She always gets back to me quickly when I have a question about one of her patterns. SOOO Handsome! Fantastic sweater! And, I am so proud of you for finishing it and making a happy hubby! Very nice... and from the dummy, it looks like you'll be able to wear it well too! Bonus! Dude, that is one awesome f*cking sweater. Seriously, it rocks. Well done!!!! Wowza! What a wonderful sweater, Cindy! Does this mean he likes it? Okay, now it's just getting ridiculous!